Expect the unexpected. That’s an old cliché that almost every band out there says when they’re asked to describe their new album or their music in general. But there are just a few bands that you can apply that on. One of those bands is Opeth. One writer once described them as Pink Floyd meets death metal and even though there might have been some truth in that, there is so much more to Opeth than that. When they started out back in the early 90’s they were more or less a pure death metal albeit with some progressive elements. But with each album, singer/ guitarist / main songwriter Mikael Åkerfeldt let the growling be replaced with clean singing and their progressive sides has taken over more and more until they lost all the growling on their last album Heritage (2011), an album that was all progressive and with almost no metal left at all. Things like that doesn’t go unnoticed in the metal camps and this change in style has been under debate since the album was released. Was the change for better or for worse? That’s in the ear of the beholder, I guess and I can only state that for me it was neither – it was just different and the very Opeth way to go. The development to a more progressive act without growl couldn’t have come as a surprise to any fan that have followed the band from the beginning. Damnation from 2003 was a mellow and soft album that sowed the first seed to growl-less Opeth and it was the first time they had released an album without any metal or growl and it was an appreciated album, but I guess that many fans saw that album as an intermission and not a “real” Opeth album. Still, the band’s magnum opus and finest effort to date, 2008’s Watershed went in a more progressive direction than any other album, even though it contained both grown and metal. I thought that Heritage was a brilliant album that without a doubt still had Opeth recognizable sound. It might have been a little harder to get into for many, when the album finally stuck, it was yours to love for life. I can understand that some might have been disappointed by the album, if metal and growl are everything you look for in music, but the fact is, Heritage sounds like a true Opeth album, just a different kind of true Opeth album, if you can dig that. Now that Opeth are about to release a new album, the big question is, which way will they go this time? Almost no news of the direction has leaked from the Opeth camp and knowing the guys way to look at things, they could just as well release a pure death metal album or an album full of power ballads. No matter which way they go, there, sure as hell burns, will be people who’ll berate them for something. Me, I’m not worried about a thing because as a fan that owns every album and more or less loves them all, I know that no matter what direction this bunch takes, they will provide us with some killer music. Everything is about how you listen to music and how open-minded you are. In my world, there are only two kinds of music – good or bad. I don’t have time to worry about genres. So with earplugs in, it’s time to digest another portion of Opeth. So, I sit back, close my eyes and let “Eternal Rains Will Come” gush all over me like a cathartic waterfall of sound. The song has all the prog elements of what we know that is Opeth, the way the bend their melodies around gives them their very own sound no matter where the go musically. There are some really cool backing vocals on here that actually makes me think of Ghost. This is brilliant stuff. “Cusp Of Eternity” is a real killer with a big nod back to Deep Purple / Rainbow and a big Ritchie Blackmore influence mixed with the Heritage kind of sound and some really memorable melodies. “Moon Above, Sun Below” is one epic track and maybe the album’s magnum opus. it’s dark, heavy and evil, but at the same time, there’s something very light and positive about the song. 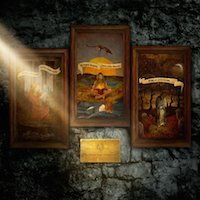 A long track – almost 11 minutes long – but as always with Opeth, it never ever gets boring and when the song ends, it’s hard to believe that 11 minutes has passed. “Elysian Woes” is a very uncomplicated and straight forward ballad, almost easy-listened, but it really sounds like Opeth. I can imagine they might even get some airplay with this one, albeit not on mainstream commercial crap radio! One of my favourites here are “River”, a song that stands out in Opeth’s catalogue of songs. It starts out as a progressive pop rock song, really catchy and even hummable, but it turns into a real hard rock song, still very in your face and without much of the complicated arrangements that we’re used to. The arrangements are probably complicated anyway, but it just comes across as a more straight forward rock track – and I love it! The album ends with “Faith In Others”, a grand ballad that wouldn’t have felt lost on Watershed. When the final chord is ebbing out, all I want is to go back and listen again. With those words I can just determine that Opeth has once again recorded a brilliant beast of an album. With their last album – Heritage – Opeth took a lot of crap from purists who declared that the band completely sucked without the heavier metal elements and the growling. Apparently it’s all about how hard and brutal the music is, for some people, not whether the songs are any good. The fact that Heritage sounded very much like Opeth didn’t seem to matter the least. For those, I guess Pale Communion will fail to satisfy because this album has more to do with Heritage than their older, more brutal album’s style. In some ways this album is more easy listening and accessible and there are parts here that are even catchy and sing-alongish. In some ways, I can understand the “purists”‘ views. I really love the harder, more metal moments and although I’m no fan of growl, Åkerfeldt has a very melodic way of growling – many times you can actually perceive the lyrics and the growling also brought another dimension to their music, but truth be told, clean vocals are so much more pleasant to listen to and Åkerfeldt really has a good voice. However, I too call for some heavier and more metal moments, but on the other side, Opeth writes such good songs that it really doesn’t matter. I, for one, love it when a band continues to develop and move forward with each album without losing identity or sound. Mind you, this band has existed for 22 years now and shows no sign of stagnation or willingness to sit down and blow their own horns, satisfied with releasing the same album one after another. That’s why I chose to start this review with the words “expect the unexpected” because if there’s one band that that fits on to, then it’s Opeth and it keeps things fresh and interesting. An awesome album and yes, it’s better than Heritage. As always, this was a pleasure to sink my teeth into. I suggest you do the same. Yeah, see Opeth aren’t really that easy to get into. Their album needs their fair share of digesting and that might take a while. It sure did for me, but when their music stuck, I found a musical love for life and I really can’t grow tired of anything thjey have ever recorded. A good tip is to start with this album and then move backwards because they were really very much death metal in their earlly days. But to be honest there hardly aren’t any of their albums that I would rate lower than 8/10, most of them are 9’s or 10’s. Oooo this makes my want the all right now! 🙂 I love an artist/album that is a challenge, especially when the challenge proves to be so worth it. I do have those official MP3s of Damnation here, I’ll go give it another spin. And you’re right, now would be a great time to get the new album – new releases tend to be at a decent price. I just know what’ll happen though – I’ll get hooked and then I’ll be in for buying, what, another ten albums? Sounds awesome to me! Thanks Jon. Awesome. Please let me know your opinions of this band when you’re done.